The Deus Ex: Human Revolution feature film project has a writer, a director and an acknowledgment that it actually exists. 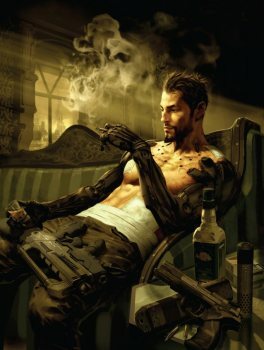 Did anyone know that plans for a Deus Ex: Human Revolution film were in the works? It was news to me, although given the game's powerfully cinematic vibe it does seem like kind of an obvious thing in hindsight. In any case, the big screen translation is on, with some guy named Scott Derrickson at the helm. Derrickson has actually been in the business for several years now, with writing and/or directing credits on films like The Exorcism of Emily Rose, Sinister and the Keanu Reeves vehicle The Day the Earth Stood Still. Derrickson will direct the film and also write the screenplay in conjunction with his Sinister co-writer C. Robert Cargill. "Deus Ex is a phenomenal cyberpunk game with soul and intelligence," Derrickson said. "By combining amazing action and tension with big, philosophical ideas, Deus Ex is smart, ballsy, and will make one hell of a movie." The announcement actually gives a nod to the original Deus Ex and burnishes its cred among fans by saying absolutely nothing about Invisible War, but says that last year's hit Deus Ex: Human Revolution will serve as "the primary template for the film." Leaving Deus Ex for the sequel, perhaps? Dare to dream! No release window has been announced.